The Commercial Real Estate Finance Council’s annual conference in Washington, D.C., brings in lenders and borrowers from coast to coast and everywhere in between, but New York City inevitably dominates many of the conversations, including Tuesday’s panel about the supply in the Big Apple’s office, retail, residential and hotel markets. Last month, Billy Macklowe didn’t mince words when he described the grim reality of Manhattan retail: “I think retail is fucked, plain and simple,” he said. 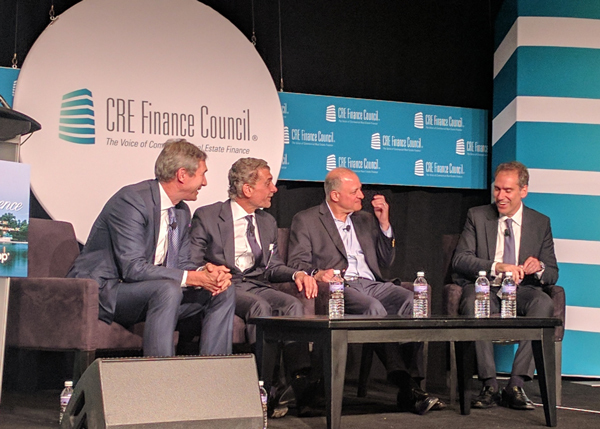 In the discussion moderated by Cushman & Wakefield vice chairman and president Steven Kohn, panelists had a more nuanced way of explaining it. Richard Wagman, founder of Madison Capital, didn’t sugarcoat that the city’s toniest retail corridor on Upper Fifth Avenue is currently stuck with vacancy rates north of 15 percent. “That’s a crazy number. We’ve never had that kind of vacancy in that submarket before,” he said. He added that despite the stress on rents, tenants like large European retailers see a Manhattan location as critical to their larger business models, and are keeping the market afloat. As for the office market, there is much speculation about how successful Hudson Yards will be once all the office space in the pipeline comes online. But what of all the space those new tenants leave behind when they move? “You’re not going to see a 20-floor tenant come in, but it gets filled up,” said Joseph Fabrizi, an executive vice president at CBRE. Durst Organization’s 4 Times Square offers one possible example of this: after Condé Nast departed for One World Trade Center, the landlord has begun filling up those empty floors, piece by piece, with smaller tenants. On residential supply, Barclays Bank managing director Spencer Kagan spoke mostly of the rather paltry pipeline of rental projects in Manhattan, and cited the one-year lapse of the 421a tax exemption as a key factor. Condo financing, especially the high end, was not really looking up much either, the panelists said. In short, there wasn’t much new to say about the residential market.